The boss gave me the day off again so I decided to attend this event. It was fun catching public transport right to the event and no parking worries. By 9.30am a group of us had gathered at the end of Platform 10 at Redfern Station and were doing quite a bit of “pre-nattering”. At 10am we made our way to the workshop forecourt and were introduced to our Heritage Tour Guide, Richard Butcher (aka Butch) by Mirvac employee Harly. The whole site, all 65 acres was sold to Mirvac a few years ago for just $150,000. What a bargain! They have maintained the Historic Workshop and there is a functioning Blacksmith Shop area still doing demonstrations and running workshops on weekends. Other parts of the facility have been developed into offices for small businesses and there are facilities for functions and seminars. Eveleigh’s workers specialised in highly advanced technologies and power systems. The site had its own power supplies – hydraulic, steam and compressed air – as well as a dedicated water and electricity to feed these systems. The existing hydraulic system at Eveleigh was installed in 1886, a year before the workshops opened, making it the oldest system of its kind in Australia. Seventy-five 36 class steam locomotives were built by Eveleigh Railway Workshops and Clyde Engineering. Introduced to New South Wales in 1925, the 36 class was more powerful and capable of higher speeds than the 35 class locomotives introduced in 1914. For over 20 years, until the advent of the 38 class, the 36 class was the mainstay locomotive of passenger services. 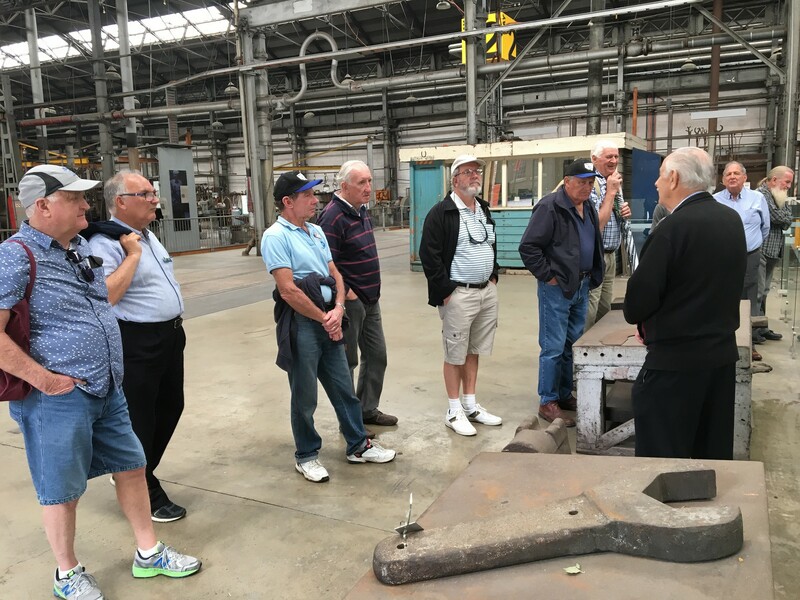 Butch, now in his eighties was a veteran of this historic workshop starting his Blacksmith apprenticeship at the Casino Depot in 1950 and later transferring to Eveleigh, eventually climbing to the rank of Senior Welding Engineer for NSW railways. His father was also a railway man and that’s how the family ended up in Casino. Since 1991, he has worked hard to have this workshop preserved because according to the Smithsonian Institute, it’s one of the finest Victorian aero steam workshops left in the world. He’s quite a character and had many interesting stories about how it operated and one can’t help but wonder how hot and dangerous this heavy work would have been. Virtually no protective clothing was worn other than work boots to protect the feet from hot metal and slag on the ground. Amazingly, there was only one person ever injured badly enough to be hospitalised for 3 weeks when a steel rod whacked the poor guy in the forehead while operating a steam hammer, used for forging red hot steel. The basic essence of the tour was how once upon a time we were self sufficient in this country. This workshop with many tradesmen, (many European immigrants) in-house could produce virtually everything it needed, without importing a thing. Mike Doggett presented both guys with some Buick Caps and Umbrellas to remember us by. It was a very good day out topped off with a nice lunch and coffee in one of the in-house Cafe’s. Butch has written and published at his own expense the book titled “Steam Days on the North Coast of NSW” which is not only about railways but also air craft built for the war effort. Consider a “Spanner n Natter” they’re good fun. Thanks Peter Allen for organising it.